In line with government reforms, Prime Minister Narendra Modi has pushed Indians to adopt cashless transactions, giving the digital payments sector a significant boost. The sector is currently experiencing an unprecedented jump in growth since early November 2016, with digital wallet companies showing a growth of 271 percent for a total value of US$2.8 billion. This is because of the demonetization of the Rs 500 (US$7) and Rs 1000 (US$14) currency notes, which represented approximately 86 percent of India’s cash in circulation. As such, the digital payments industry represents an attractive destination for foreign investors keen to establish a foothold in India. In line with government reforms, Prime Minister Narendra Modi has pushed Indians to adopt cashless transactions, giving the digital payments sector a significant boost. The sector is currently experiencing an unprecedented jump in growth since early November 2016, with digital wallet companies showing a growth of 271 percent for a total value of US$2.8 billion (Rs 191 crore). This is because of the demonetization of the Rs 500 (US$7) and Rs 1000 (US$14) currency notes, which represented approximately 86 percent of India’s cash in circulation. 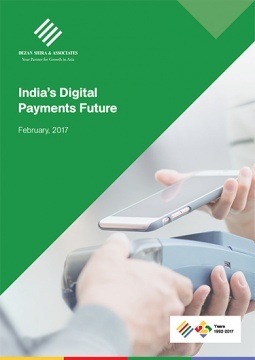 Prior to the sudden developments in late 2016 enabling a massive disruption in India’s payments landscape, a Google-BCG Report estimated that India’s digital payments industry would grow to US$500 billion by 2020, contributing to 15 percent of the country’s GDP. An important driver of this growth is India’s smartphone user base, which is the second largest in the world. In addition to private actors, the Indian government has also pushed several payments apps, including the Aadhaar Payment App, the UPI app, and the Bharat Interface for Money (BHIM) app developed by the National Payments Corporation of India (NPCI). Such apps make it easier to transfer funds in India’s rural community, and more importantly will facilitate a behavioral change towards greater adoption of cashless services. As such, the digital payments industry represents an attractive destination for foreign investors keen to establish a foothold in India.